The figures are contained in the organisation's annual Communications Market Report. It is based on an online survey of 1,000 adults carried out in April by YouGov. Ofcom suggested that posting family videos and photos to social media had become a "Marmite issue" - a reference to the opinion-splitting food spread. 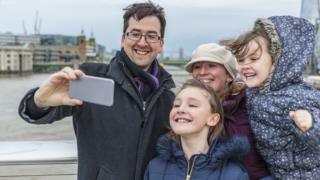 "Parents are really divided about whether it's sensible to share photos of their children online," Ofcom's consumer group director Lindsey Fussell told the BBC. Of the abstainers, 87% said their offspring's lives should remain private, and 38% said their children would not want them to upload the material. Is too much TV making you tired? Most of those questioned acknowledged that they tended to accept social media and messaging apps' terms and conditions without reading them, and half acknowledged it was not always easy to erase imagery from the net once it had been uploaded. In light of the findings, the NSPCC children's charity urged parents to carefully consider the issues involved. "For very young children, think about whether they would be happy for you to post or if it will embarrass them. If you aren't sure, it's best not to post." The report also pointed to a disconnect between how people felt about their own self-portraits and what they thought about others': 61% of respondents said their own images were an accurate reflection of themselves, but 74% said at times other people's presented "rose tinted" versions of their lives. It revealed that on average the participants used Facebook's app 11.7 times a day. By contrast, the figure for YouTube was 2.6 times.